When I first started seeing ads for Illumination’s attempt at adapting Dr. Seuss’ How the Grinch Stole Christmas, my first thought was, “Oh God, here we go again.” I think many people probably shared the same sentiment; you hear a lot of mixed opinions on the 2000 Jim Carrey version, but I think most would agree that the 1966 animated TV special is the best adaptation of the story. It’s a pretty straightforward interpretation of the book, it’s iconic, and it’s got Boris freaking Karloff as the Grinch/narrator! Personally, at risk of being unoriginal, I love the original cartoon and grew up watching it every year. It’s pretty much a perfect adaptation, something that hardly exists anymore, and it’s very much what I think of as traditional Christmas. 2018’s The Grinch is not traditional, and it’s not a straightforward adaptation. Typically, I prefer things that are traditional, especially when it comes to Christmas; last week, Disney’s interpretation of The Nutcracker irritated me with its lack of traditional Christmas spirit. Let’s see how The Grinch fares as a Christmas movie, an adaptation, and simple entertainment. You’ve got the obvious story beats, such as the Grinch stealing Christmas and seeing the error of his ways, but some of the presentation is updated. The Whos are still very stylized and, at times, kooky, but they live in a modern world with modern amenities and clothing. Cindy-Lou’s wish is an addition to the story, and what she wishes for in particular feels very contemporary. 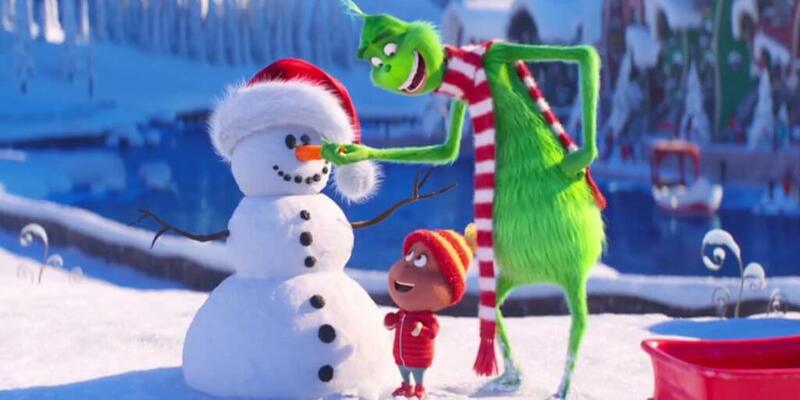 The Grinch does a couple of things from the Jim Carrey version, such as giving Grinch a backstory and trying to emphasize his friendship with Cindy-Lou more than in the book or the first cartoon. In the live-action movie, the tragic backstory didn’t really work because Grinch was raised by two women who apparently loved him. Being bullied is tough, but it hardly justifies his behavior well into adulthood. It’s also difficult to fully accept that he’s this bitter and ungrateful when he had a loving family, albeit an unconventional one. His relationship with Cindy-Lou is probably the best thing about the live-action film, though it would work better if Carrey’s version weren’t quite so despicable at times. In truth, Dr. Seuss stories shouldn’t be adapted in live-action; they’re so zany and the designs so outrageous that with real people it just seems forced. It also grounds the story in a way that doesn’t work. The worst thing about the live-action Grinch movie, though, was the Whos as a whole. They make a big point throughout of how commercial and materialistic the Whos are, except for Cindy-Lou, of course. They compete over who has better Christmas lights, decorations, and even clothing. In the end, the residents of Whoville must learn along with the Grinch what Christmas really means. This is a valid idea for a story, but it feels like they totally missed the very obvious point of the original. All of the Whos are good people who love each other and view Christmas as more than presents and decorations, and that’s what inspires development in the Grinch. Showing Cindy-Lou becoming disillusioned by her superficial neighbors and family isn’t a bad concept, but it’s not the Grinch story. That being said, The Grinch seems to have a much better grasp on the types of things it can change while staying true to the book’s spirit. When it comes to adaptations, it’s less important to me that it be a word-for-word transfer than that the filmmakers understand and love the source material. The Grinch’s backstory here actually explains his behavior, if not justifies it. You can actually see how growing up this way would make him feel isolated and depressed, which goes a long way toward making the character sympathetic and his arc more believable. His relationship with Cindy develops subtly through a few simple interactions, and for a short Christmas movie, I’d say that’s about right. We don’t need an hour of them going around together to accept their friendship. In fact, the film is brief in general at 90 minutes, and that’s for the best; I’d rather watch a shorter film with a simple message than an over-bloated movie that’s trying to be more important than it is. Additional characters, like Kenan Thompson’s Mr. Bricklebaum and Fred, the reindeer from the trailers, work surprisingly well. The voice acting is good, particularly from Thompson and an unrecognizable Benedict Cumberbatch in the title role. The score by Danny Elfman is good and pleasant, but probably not something you’ll notice throughout the film. I didn’t much care for the new version of the Grinch theme song, but I already knew that from the trailers. I did enjoy several of the other Christmas songs interspersed throughout the film, but in fairness, several are classic songs that I already knew. I also knew from the trailers that I didn’t care for the film’s animation style; technically, the visuals are impressive, in that there’s a great amount of detail and the texture of skin and clothing is amazing. Nonetheless, I don’t like Illumination much as a studio, and I tend not to care for their character designs. The Grinch himself is pretty standard, but the Whos are a fairly big deviation from their traditional designs. Luckily, visuals aren’t the most important thing in a movie to me, and the film’s other charms won me over. I do want to say that it’s always annoyed me when people call movies cute, especially animated films or ones intended for children and families. It always seemed condescending, like they were saying it was harmless and pleasant but not really for adults. However, regardless of demographics or medium, I have to say that The Grinch is very cute. Grinch’s dog Max and Fred the reindeer both elicited laughs and sighs of adoration from the audience, and even the humanoid characters said/did a couple of things throughout that warranted an “aw,” or maybe even a tear here and there. I wasn’t looking forward to seeing The Grinch, and in fact, I had originally intended to skip it in cinemas. It was fortuitous that I’d already seen everything else currently in theaters that I had any interest in because this was a pleasant surprise if ever there was one. The Grinch isn’t perfect; some of the technical aspects didn’t quite click for me and the comedy is hot and cold. But the story serves as an effective and well-thought-out update of the book, the characters are lovable, and the whole film has a feel that would be best described as charming. Unlike Nutcracker and the Four Realms, as well as the other Grinch feature, The Grinch knows what to keep from its source material and what to update while retaining the spirit of the story, as well as that of the holiday overall. Whether you have kids or are a big kid yourself, I’d definitely recommend giving The Grinch a chance this holiday season. The Grinch isn’t perfect; some of the technical aspects didn’t quite click for me and the comedy is hot and cold. But the story serves as an effective and well-thought-out update of the book, the characters are lovable, and the whole film has a feel that would be best described as charming. Unlike Nutcracker and the Four Realms, as well as the other Grinch feature, The Grinch knows what to keep from its source material and what to update while retaining the spirit of the story, as well as that of the holiday overall. Whether you have kids or are a big kid yourself, I’d definitely recommend giving The Grinch a chance this holiday season.